4. Help us shape a year to come with your suggestions - you could walk away with a freebie! Submit your handmade wedding invitations for a chance to win one of fantastic prizes for you or a friends upcoming wedding! The top three most creative and stylish DIY wedding invitations will be picked form our expert panel of bloggers. The judges are (drum roll please)... Kymora from BecomingtheMrs.com, Jessica Bishop of Thebudgetsavvybride.com, and Lauren Donaldson of LaurenEliseCrafted.com and featured DIYer on Emmaline Bride. Custom Couture Wedding Album from Specht Couture Books and Design. The first prize winner will receive a large custom 9 x 12 wedding album created by Shelby Specht of Specht Couture. These books are truly one of a kind creations, made by hand, all in one albums incorporating the guest book, wedding album, and scrapbook together as one book. A Custom Calligraphy Package from Angelique, Ink. This second place prize package will include 50 envelopes hand addressed in your choice one of Angelique's original calligraphy styles, and 1 custom handwritten calligraphy return address stamp. The third place prize package includes a gorgeous handmade ring bearer's pillow, a bridal sash in either pink or tan, and a beautiful handmade bridal hair accessory from Avenue C of Etsy.com. We will also hold a random drawing giveaway amongst the contestants to win a custom designed printable wedding invitation map for your invitation inserts or to place in OOT visitor guest bags. For more information or to submit your entry visit our contest page. Introducing the newest addition to our Printable Invitations Online Shop - The Funky Paisley Collection! This template is available in a range of different color combos. If you love the style but do not see the colors you're looking for be sure to drop us an email as we can create custom color combos as well. 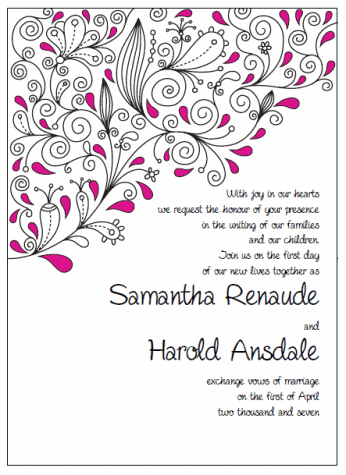 We are now offering printable templates for printing and making your own invitations. 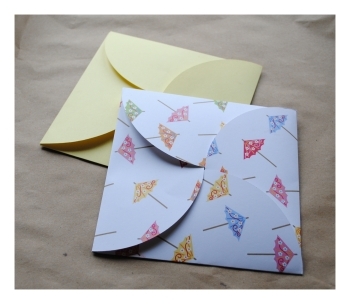 It's a fast, easy, and affordable solution for your party invitation needs. Print them in the comfort of your home! 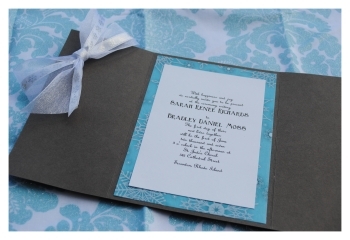 To use our printable invitations simply download the template, open the PDF file, and set to work on customizing them yourself with our interactive templates. Simply highlight the text you wish to change and start typing. You can change the wording, font, size, and even colors of the text. Print them on your home computer printer, trim them, and then pop them in an envelope and into the mail. 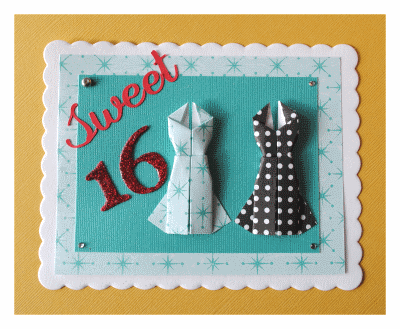 For extra special invitations you can attach them to a fancy card stock backing, and add ribbon, charms, or glitter and rhinestones. Get creative! For more information or to view our available designs for Wedding, Baby Shower, or Birthdays visit Our Printable Invitations Shop. Be sure and check back often. We will be adding new designs all the time! 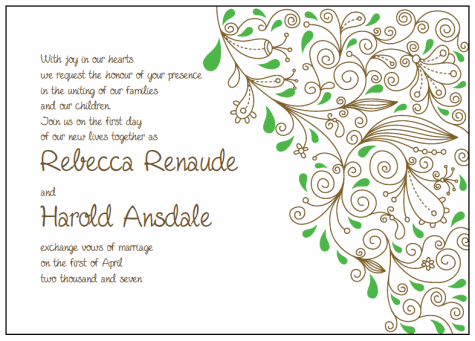 For the entire month of February we are offering a %15 discount on all printable templates offered in our online shop. Just enter code 965590R4 at checkout! As Do-it-yourself-invitations.com's reader base grows I really want to continue to give you all what you really want! I want to OVER deliver info and content to the highest extent. So I'm asking for your future wish lists and suggestions. I want to add tons to the printable invitations shop, as well as tons of freebies AND new info and tutorials. SO, Is there something you would really like to see in our shop or on our website that we haven't touched on yet? Is there a great product you'd like to see showcased? Or maybe wish we had some more freebies to choose from? Let us know and if we pick your idea you will receive a thank you gift from ME personally!